In Part 1 of In Search of Hess’ Triangle, I presented some historical maps of the area and did some analysis using modern GIS software. 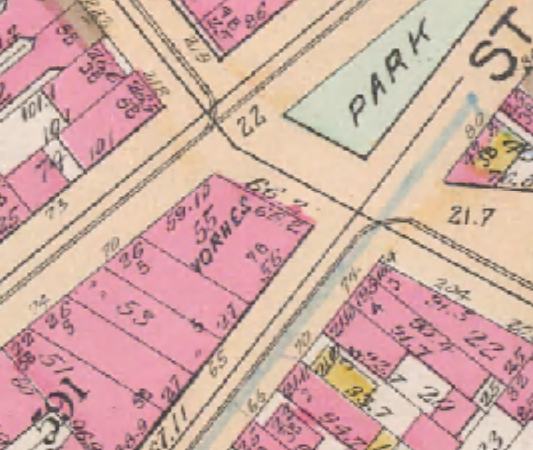 In this post, I’ll share some historical news articles about the 7th Avenue Extension and Hess’ Triangle, and show a few more of the tiny parcels that still exist in the west village today. I’d love to see what some of these objections look like, and wonder if they are archived anywhere. 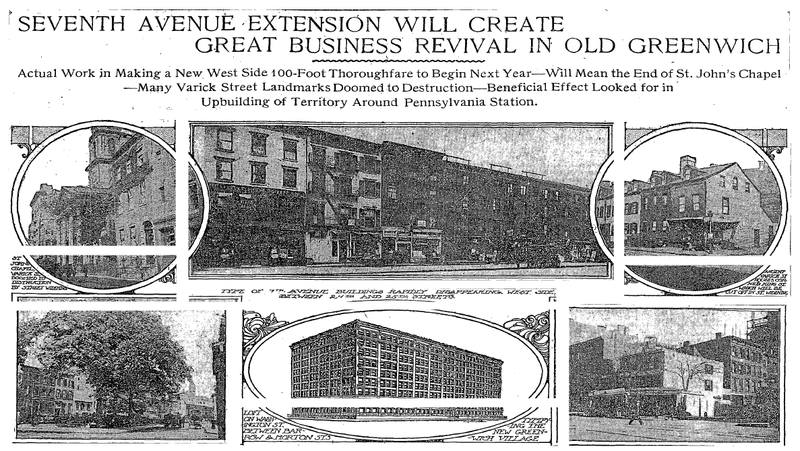 The article concludes with a list of landmarks and prominent buildings that will be affected by the 7th Avenue Extension, but it appears that Mr. Hess’ Voorhis Building is not notable enough for mention. 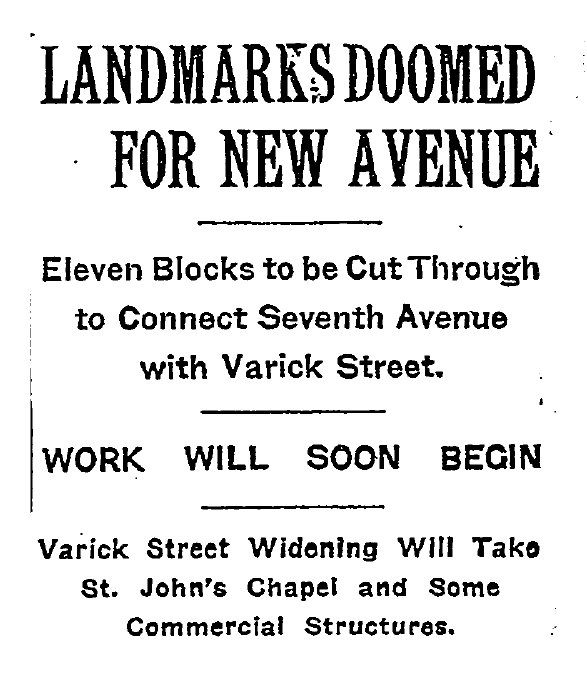 Another NYT article from 1913, just prior to the start of demolition, goes into greater detail about landmarks that will be lost. Was this the Hunts Point of it’s day? Interestingly, the city was allowed to take control of the properties before the owners were compensated. “Hearings on the properties are now being conducted…The right to demolish buildings for a public improvement before their value is fixed by a commission is provided for in the city charter.” I would really love to find more information on this, including transfer paperwork or deeds. Does anyone know where to look? “The entire Fourth Street front between Grove and Christopher Streets, 66.4 feet on Fourth Street will be torn out. This is occupied by a seven-story apartment and it is one of the few doomed structures now entirely vacant. A part of the little park in front of the building will also go”. There it is! This contradicts some modern articles about Hess’ Triangle that state that the apartment building on the site was five stories tall. According to the historic maps in part 1, the frontage is actually 66.2 feet, so the article’s description is off by 2.4 inches. It turns out there was an article written in the New York Times the day after the tiles were laid. It’s short and sweet, and confirms that Hess’ Triangle’s tiles were installed on Wednesday, July 26th, 1922. I wonder if they had to get a permit for this work, and I wonder if there’s any record of it. 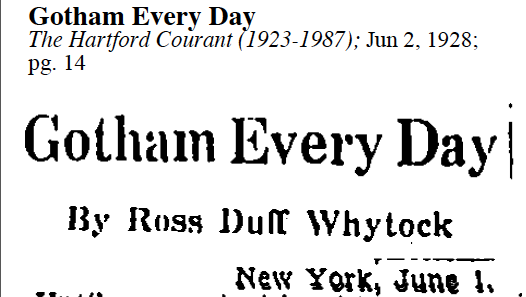 Last but not least is an article from the Hartford Courtant from 1928. The piece is called “Gotham Every Day” and is comprised of little snippets of NYC lore. 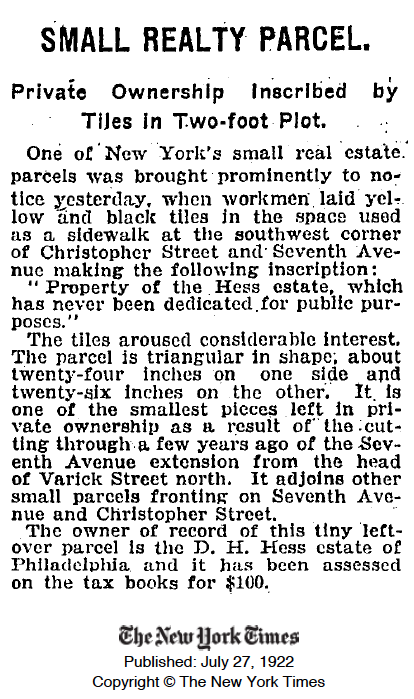 It gives a pretty standard account of Hess’ Triangle, but also states that David M. Hess died in 1907, 6 years before the 7th Avenue Extension was built and 15 years before the tiles were laid. How can we figure out how he died and who executed his estate? This article also has a funny story about a landowner who pranked the city, stating that he was going to donate land for a public park… when the time came for the ribbon-cutting, it was an 8 square foot parcel of land. Trolled Hard. This weekend, I finally had a chance to visit the site in person, and took a couple of graphite rubbings. I’m working on getting one of these framed, and may offer a print if anyone is interested. As we saw in part 1, Hess’ Triangle is no longer its own parcel of land, and was consolidated with the neighboring parcel sometime in the 30’s. (I would love to find a property record for this as well). However, there are still several small parcels leftover from the 7th Avenue extension that still exist today. Using QGIS, I filtered Manhttan’s MapPluto shapefile for parcels under 100 square feet (there are 56 of these “microparcels”. Below is a map that shows all of them as polygons with an associated marker. You can see that several are located along the 7th avenue extension. Zoom out to see others, and click on a marker to see the Address, BBL, Owner’s name, and lot size. That’s all for now. Thanks for reading! 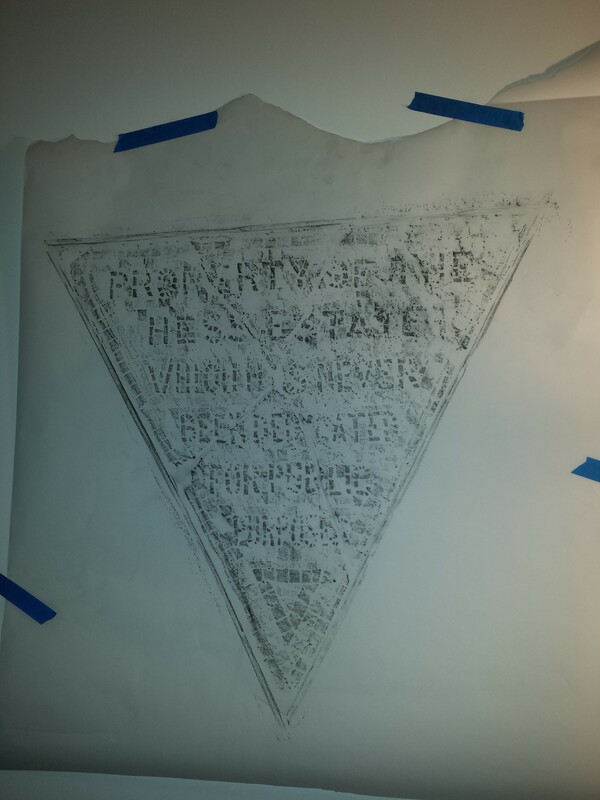 I would like to locate archival documents for the various transfers of Hess’ Triangle over the years (when the city first carved it up, and when it was sold to the neighboring lot in the 1930s). If anyone knows where to look for these, please let me know in the comments. One Response to "In Search of Hess’ Triangle – Part 2"